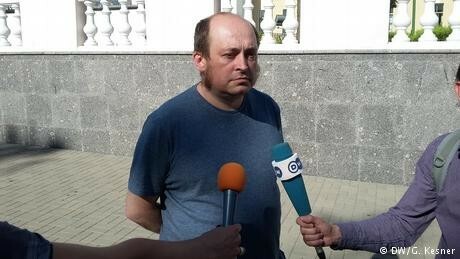 DW journalist Paulyuk Bykowski, who was arrested by investigators in Belarus, was freed on Friday. Bykowski was among a group accused of breaking into the computer systems of state-run news agency BelTA. Bykowski's arrest on Wednesday had followed the detention of at least four journalists from popular news sites in the country. The group had been accused of unlawfully accessing news from the state news agency. Police searched the offices of media organizations and journalists' apartments, seizing computer equipment and bank cards. After the arrests, DW lodged a protest with the Belarusian ambassador in Berlin and demanded Bykowski's immediate release. It stressed that the rule of law must apply to accredited journalists. On Thursday, the German Journalists Association (DJV) also appealed for Bykowski to be released. DJV chairman Frank Überall urged the German government to use its influence with the Belarusian government to appeal on the journalist's behalf. According to local human rights groups and Bykowski's wife, Volha, the arrests were part of a clampdown by Belarusian authorities to silence the independent press. The Belarusian government has denied this. President Alexander Lukashenko has run Belarus — sometimes dubbed Europe's last dictatorship — along autocratic lines since 1994. Although Lukashenko has heeded some calls from the West to be more tolerant of political opposition, opponents say their operations are still severely limited.